Create your own fragrance at home. Urban Botanic is a new direct sales party-plan company offering women the opportunity to create their own scents in the comfort of their own homes. The scent creation process begins with Urban Botanic's Scent Test, where customers discover which scent families best fit their personalities. Urban Botanic's scent families are floral, fruity, herby, leafy, spicy, and woodsy. The floral family contains 15 perfume oil fragrances including favorites like freesia, jasmine, and rose. The fruity family contains 17 oils in such succulent scents as coconut, frangipani, mandarin, raspberry, strawberry, and vanilla. The herbies include the comforting scents of chamomile, garden mint, and lavender along with six others. 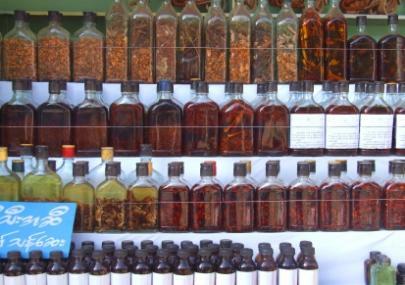 The leafy family is home to nine fragrances including cucumber, green tea, and honeysuckle. The spicies are eight intoxicating oils like bergamot, fig, and maple spice. The earthy, woodsy family also has eight fragrances which include oak moss, pine, sandalwood, and two varieties of musk. Once the customer has chosen the perfume oils for her custom fragrance, a trained Scent Consultant leads her through the scent creation process using a patent-pending fragrance design system. Once the perfect scent has been created, the customer can add the fragrance to Urban Botanic's parfum base for a scent that is uniquely hers. The parfum spray goes on dryly and silkily for a luxurious feel on the skin. Another positive is that Urban Botanic's parfum base contains only two ingredients, cyclotetrasiloxane and cyclopentasiloxane, which are silk amino acids. Because there are no harsh ingredients such as alcohol or formaldehyde, many women who could not previously wear perfume can now enjoy using their own customized scent as their most powerful accessory. Headquartered in Orem, Utah, Urban Botanic was founded in 2005 by McKenna Gordon to celebrate individuality and help customers create a lovely fragrance portraying those unique and wonderful character traits that every human possesses. The art of perfume making can be complicated, but Urban Botanic's patent pending process makes it very simple and affordable for anyone to create their very own signature fragrance. Urban Botanic manufactures proprietary formulas for unscented, hypoallergenic, high-grade lotions, perfumes and other products that blend with their perfume oils. The base products and perfume oils are formulated to saturate immediately upon mixing and stay blended throughout the shelf life of the product. The cost of the products ranges from $12.50 for an 8 ounce bottle of shower gel or bubble bath, $14.50 for an 8 ounce lotion, to $24.95 for a 2 ounce parfum spray. For more information on Urban Botanic and how to find a consultant in your area, visit the Urban Botanic website or telephone the corporate headquarters at 801.802.2203.